The oldest form of runic scripts, Elder Futhark is named for the first six runes in its alphabet, F, U, Th, A,R, and K. It was used in the North West of Europe from around the second to the eighth centuries AD and has been found on numerous artefacts ranging from jewellry and amulets to tools, weapons and the ever-popular runestone. From the sixth century, Younger Futhark began to develop out of the Elder form before it became prominent in scandinavia from the late eighth century. Later still the Anglo-Saxons and the Frisians developed it further into Anglo-Saxon Futhark. Unlike other forms of runes, the skill of reading Elder Futhark was lost overtime until it was rediscovered with its decipherment in 1865 by the Norwegian Sophus Bugge. The Elder Futhark alphabet consists of twenty-four runes which are traditionally set out in three groups known as aett. The alphabetic order which gives the script its name is first attested from around 400 AD. The direction of the text tends to vary in the earliest inscriptions but it later appears to settle into running from left to right. There are no word divisions in the majority of inscriptions except in a few cases where a series of dots were used to separate words. The angular shapes that the runes are formed by are probably the result of the original incisions make by writing materials like those made by the reed implements to form cuneiform. The alphabet itself is believed to be a derivation from Italic alphabets, possibly a form of Etruscan or Raetic or even Latin. There was a popular theory previously that the alphabet was derived from the Greek alphabet via the Gothic. However, the date of early inscriptions predates the Gothic communications with the Greeks and so this theory has been ruled out. It is believed that development of Elder Futhark was composed by a single person or group around the first century AD. The definite purpose for its invention is unknown but epigraphic purposes have been suggested alongside the magical, practical and the playful. Baeksted (1952) suggests use in graffiti. The runes for F, A, G, T, M, and L appear to be identical to old Italic or Latin alphabetic forms. There is also some correspondence in the runes for U, R, K, H, S, B, and O. The rest of the runes are likely adaptations from other sources or original innovations with the creation of the scripts. The rune names are based on the sounds of the runes themselves but also have a basis in mythology, nature and the environment, daily life and the human condition. 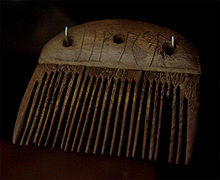 As mentioned, inscriptions are found on a range of artefacts between the Carpathians and Lappland with the majority of examples hailing from Denmark. The oldest inscription found dates to 160 AD and is found on the Vimose Comb reading simply HARJA. 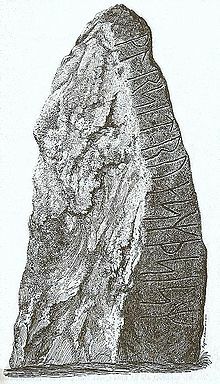 The longest inscription found consists of 200 characters and dates to the eighth century Eggjum stone containing a stanza of Norse poetry. Younger Futhark developed out of Elder Futhark in a transitional phase dating from around 650-800 AD. 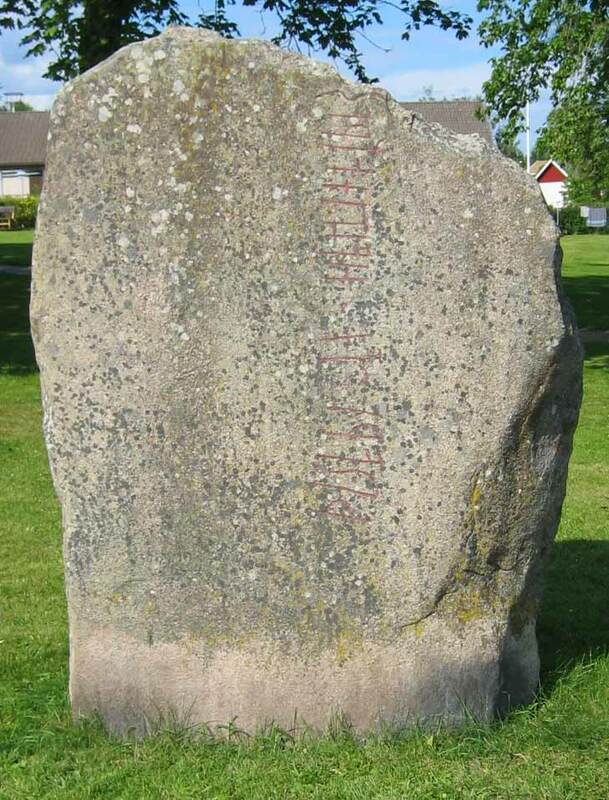 It is also known as Scandinavian runes and is referred to in the Book of Ballymore as the ‘Ogham of the Scandinavians’. It is a reduced form of Elder Futhark and is found in inscriptions from Scandinavia and Viking Age settlements. Younger Futhark is also known as the alphabet of the Norsemen and is believed to have been developed for use in trade and diplomatic contracts. The alphabet consists of only sixteen characters which were in use from the ninth to the twelfth centuries. Its format consisted of distinct sounds and minimal pairs. One key rule in the younger Futhark texts is the avoidance of having the same rune twice in consecutive order. Younger Futhark actual includes two scripts. The first is made up of long-branch runes which are believed to have been used for documentation on stone. The second script is made up of short-twig runes which were likely used for everyday uses, for private and official messages on wood. The short-twig forms include nine runes which appear as simplified variants of the long branch runes. The Younger Futhark developed later into a range of additional scripts including Halsinge Runes, Middle Age Runes, and Latinised Dalecarlian Futhark. AP In memory of Hariwulfar. Haþuwulfar, Heruwulfar’s son,AQ Haþuwulf(a)r, Heruwulfar’s son, in memory of HariwulfarB wrote these runes. 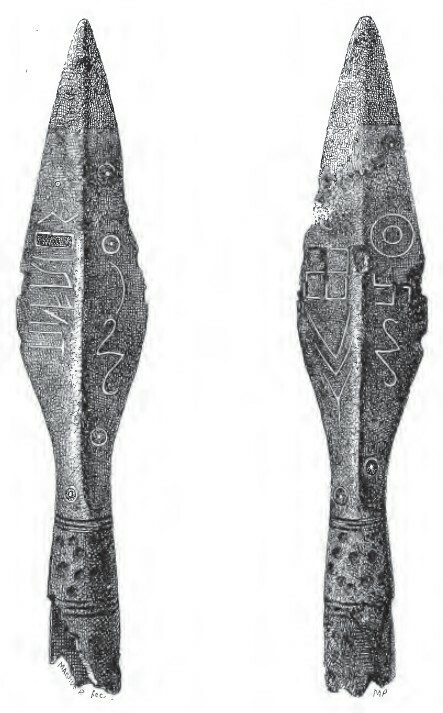 Spearhead of Kovel – The Spearhead of Kovel is the head of a lance found in 1858 in Ukraine. It dates to around the third century AD and measures 15.5cm. The inscription on its blade reads from right to left TILARIDS meaning ‘thither rider’, which is interpreted as either the name of a warrior or of the spear itself. It is believed to be Gothic in origin.